The Infinity Chilli, now a record breaker. 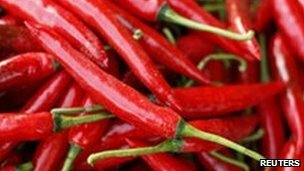 Experts have pronounced a chilli grown in the market town of Grantham, Lincs, as the hottest in the world. 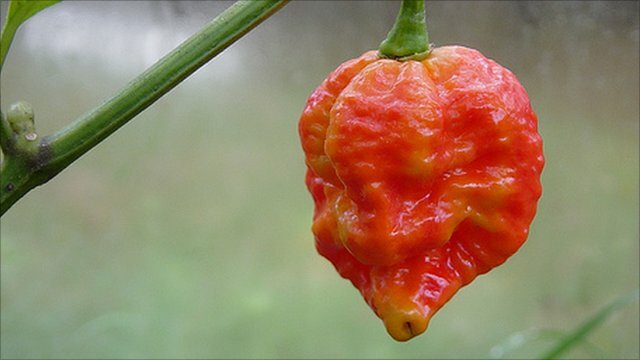 Tests have revealed the "Infinity Chilli" to have a Scoville Scale Rating of 1,176,182 - hotter than chilli reportedly used in hand grenades by the Indian military. But what is the attraction of this insanely hot ingredient? The story of the world's hottest chilli begins not in Mexico or Bangladesh, but next to the barbed wire at RAF Cottesmore in Rutland. Nick Woods, working shifts as an RAF security guard and considering his growing family, decided he had to do something more entrepreneurial with his life. That was five years ago. What was Nick's hobby - cooking up hot sauces in his kitchen - developed into his Fire Foods sauce business, and now the 38-year-old Grantham man finds himself literally in possession of hot property. Like many great discoveries Nick says he developed the Infinity Chilli accidentally. "There are 4,000 different varieties of chilli," he explains, "and they're really easy to cross. "I knew as soon as I saw it in the polytunnel. It stood out, and when I dissected it I could tell by the skin tissue and the seeds that it was a hot one." Technically the chilli is not a vegetable but a fruit, from the plant genus "Capsicum". The heat comes from the substance "capsaicin" which is found in all chillies. The attraction of it lies in the way it livens up our foods and makes the body produce pleasurable endorphins afterwards. The chilli fire is measured by the Scoville Heat Unit (SHU) designed by American chemist Wilbur Scoville in 1912. To put the Grantham chilli in context, a Jalapeno can score anything between 2,500 to 8,000 SHU on this scale. The Bhut Jolokia chilli weighs in at just over 800,000 SHU. The Indian military are reported to have developed a counter-terrorism hand grenade which uses it as an ingredient to immobilise their adversaries. 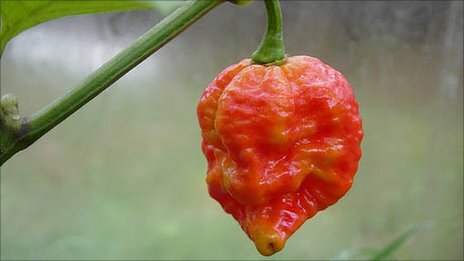 But Grantham's Infinity Chilli has scored 1,176,182 SHU in a test done last year by Andrew Jukes, a scientist at the University of Warwick's Crop Centre. It's boom time for the chilli, because Britain's taste buds are thoroughly globalised. Many of us get used to curries and other hot snacks at college. Now the experts say we're looking for bigger and better chilli-based thrills in the kitchen. Cookery writer Michael Michaud runs an online chilli supply firm and was responsible for the development of the "Dorset Naga", until recently one of the hottest known chillies in existence. "It's a versatile spice," he says. "And the vast majority of British people have been eating chillies, and have been for years, because almost every high street has an Indian restaurant. "But I think people are growing and cooking with them more. And now it's a bit like an arms race, with a macho culture going on, you know, I can eat one that's hotter, and so on. "And trying to grow the hottest one can also get obsessive." But the British attraction to the chilli is more than simply a yearning for the burn. There's evidence our palates are becoming more sophisticated as our exposure to it lengthens. "When Indian restaurants first arrived in the UK... they'd just use the one kind of chilli powder," remembers Manoj Vasaikar, head chef at the well-regarded West London chain of Indian Zing restaurants. "Now it's much more subtle and we're using chillies with lots of different tastes and textures. We don't try to overpower the food." Despite the obvious immediate discomfort - not to say total agony - that comes from eating the hottest of peppers, doctors are yet to notice any lasting ill effects from them. In fact it's thought they could play a valuable part in pain relief and there are reports of them being used to help people undergoing chemotherapy. Earlier this week Nick Woods decided to try one of his Infinity Chillies. "I actually ate one yesterday. It was one I'd had frozen from last year - so I thought it wouldn't be as hot as if it was fresh - and I thought I'd try it. "It was all a bit worrying. The burn on my tongue lasted half an hour and the effects went on and on. At one point I was doubled over in pain and thinking about ringing the hospital. "The worst was over by 11 o'clock, but it wasn't funny." Fire Foods - developer of the "Infinity Chilli"
Sea Spring Seeds, developer of the "Dorset Naga" chilli.